I can't guarantee that the Synthe is the only reason I am here to write this, but I'm certainly not going to pretend it didn't help. Last summer, descending at about 12-14% on a perfectly smooth road my Garmin says I was going about 45 mph. The road was wide open, no one in ahead or behind me, it was hot, about 90 degrees. As the pitch relaxed down to about 8% I approached an intersection, going west I didn't have a stop sign. About 50 yards out I saw a car approaching the intersection from my right (coming from the north), the driver had a stop sign and did stop. Then he went. I had just enough time to brace for impact before going into the rear driver's-side door, my bike coming to an immediate stop. My body on the other had went shoulder-first into the roof line, flipped me over the roof, and I landed on the back of my head rolling onto my upper back and stopped seated upright facing downhill. The impact virtually ripped the front end off of my bike, you can now look into my top tube. All I could do was lay in the road until the ambulance showed. While I waited the driver sat on the hot pavement next to me crying and apologizing. Within about 5 hours I was in my car on the way home. I was sore, for sure. Limping with back and hip pain, the worst of everything was some torn ligaments in my thumbs from ripping the bars out of my hands. No concussion. Not even a scrape on my head or face. When this went down I had on a black and blue Synthe MIPS helmet. Would another helmet have protected me as well? I hope so, but that's not a question I really care to test to find an answer to. Looking back on that day, I have yet to go on a bike ride without a Synthe MIPS on my head. 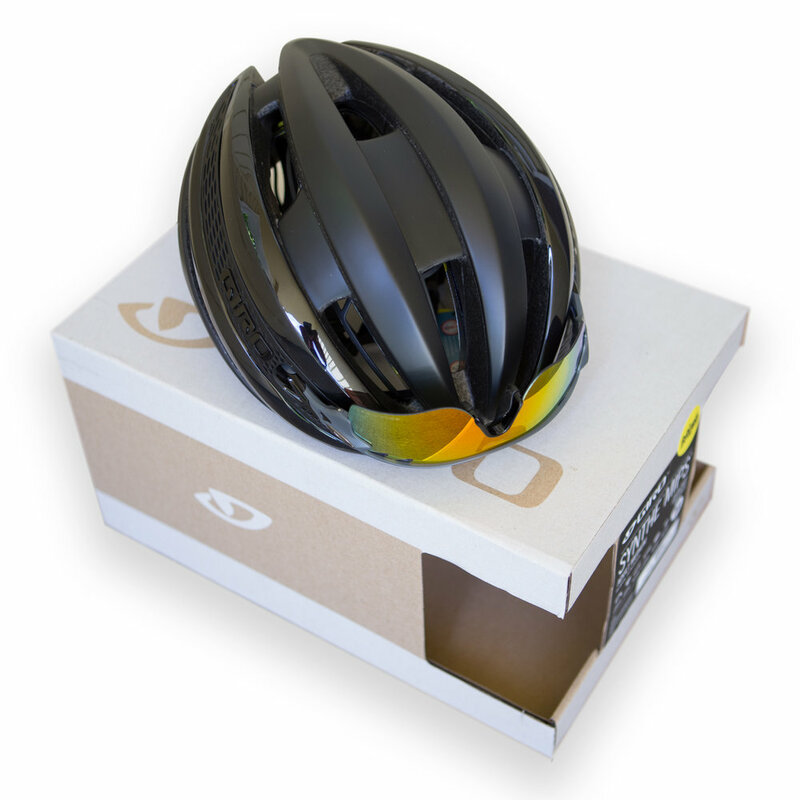 At a claimed 270g (my medium weighs in at 268g), this helmet is plenty light. While I'm not much of a weight-weenie, saving grams on equipment that hangs on my head is a great place to make sure my neck doesn't get unnecessarily tired. As you can see in the below pictures, my Oakley glasses slip right in perfectly. I've ridden through an entire winter of mountain biking with glasses up there and they don't budge. Huge. I don't know if the GIRO Synthe MIPS will save your life. Of course, best case you'll never need to know and instead just replace it after its lifetime is through and it never hits the ground. But, if that chance comes where you really need to test your lid, make sure it's the best.